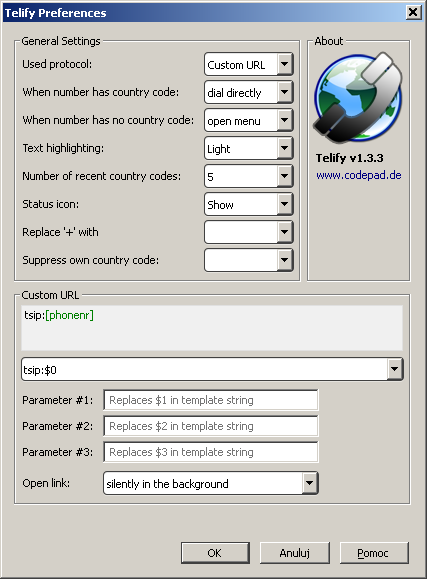 tSIP softphone can be integrated with web browser (or e.g. mail reader like Thunderbird) using Windows' custom protocol mechanism. 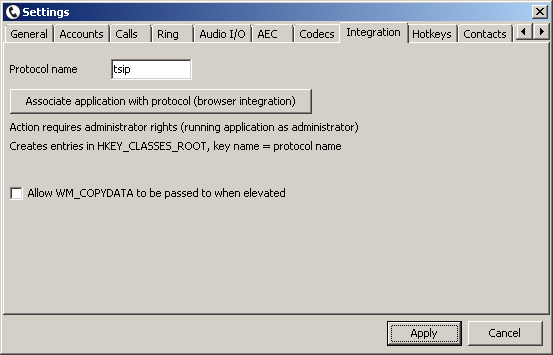 To create protocol association run tSIP as administrator and use function located in Settings/Integration. To remove association manually delete registry entries. Note: administrator rights are needed only for protocol registration (and may collide with normal operation under Vista and newer Windows version), launch application as usual after this. Some browsers (Firefox-based in particular) may be not be able to check registry for protocol association or be not flexible enough to pass parameters as required by application. How does it work? 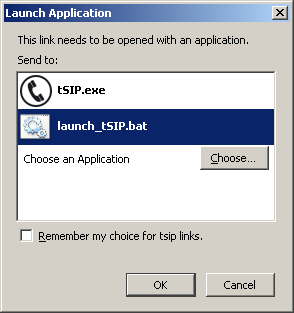 After clicking the link tSIP.exe is launched with specified parameters. Since typically you wouldn't want to launch new copy of softphone with every new call (and it wouldn't make any sense with HANGUP command) first thing that application is doing is checking if another copy of it is running. If another copy (or more precisely: main window of another copy, though it does not have to be visible, application may sit in tray all the time) if found then new instance passes arguments to it and closes silently. If another copy is not found, then new instance executes command by itself (i.e. user sees softphone launched). This function is intended for business/CRM-like usage, so softphone filters out from dialed number any digits outside of standard DTMF set. Thus, spaces or () for specifying regional number can be used freely inside of links. 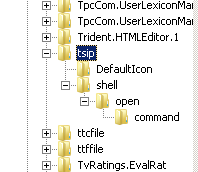 tSIP uses WM_COPYDATA message to pass command between instances. In some cases - when target application runs with elevated privileges - newer version of Windows (Vista and above) block passing this message for security reasons. "Allow WM_COPYDATA to be passed to when elevated" disables this by using ChangeWindowMessageFilter function. Application restart is needed. Note: try Telify extension for Firefox and Thunderbird!